Government Propaganda Mascots #1: NSA's Crypto Cat - The original Crypto Cat design, before he was split up into the CryptoKids. GPM Update: Crypto Cat - The CryptoKids debut, along with first reference to Y. R. Tap. NSA Acknowledged Existence of Y.R. Tap - Why you need to look carefully at Google Image Search results before publishing them in your newsletter. NixonFly - Pre-millennial Y.R. Tap? MuckRock's ongoing FOIA request for the CryptoKids - So far, not much. 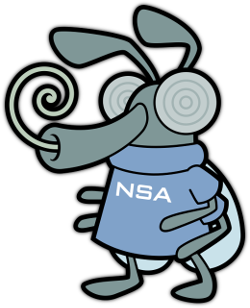 The CryptoKids characters and names are trademarked by the US National Security Agency and are used for satirical purposes without permission. "Rosetta Stone" is a trademark of Fairfield Language Technologies and its use is acceptable collateral damage. Other mentioned company trademarks belong to their respective owners. ZPi is not associated with the NSA, the US Government (either Federal or Shadow), or the International Union of Espionage Doers.